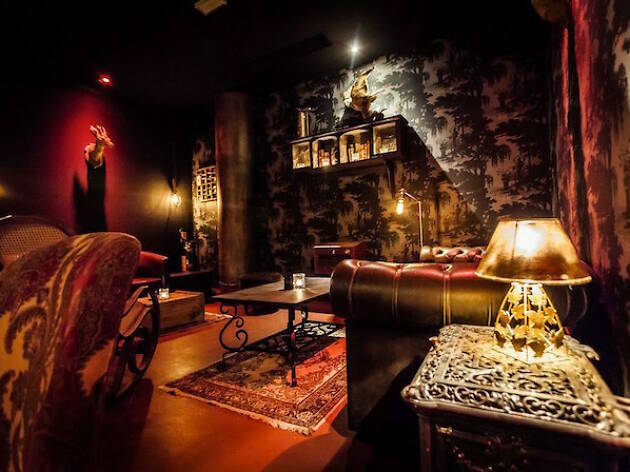 From passwords and cocktails to live jazz and fedoras, this speakeasy-style bar is a cut above. 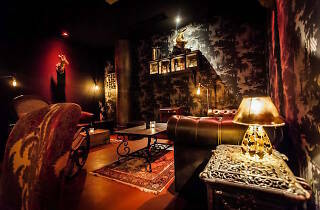 This speakeasy-style bar in 8th arrondissement does its fashionable best to capture the feeling of a clandestine bar in 1920s Chicago, as Prohibition was in full swing. Hidden behind a large black door, Blaine is located at the bottom of what appears to be a disused staircase. Whisper a password, follow a corridor and open a door, and only then will you reach the small candlelit space. The cheery staff all wear black trousers with braces, a white shirt and fedoras, while live musicians play jazz standards. Well-dressed guests pose on comfy velvet chairs, sipping their way through the menu of strong spirits and elaborate cocktails (€13-€18). Standout mixes include the tangy Byzantin (with Sailor Jerry rum, fresh mint, passion fruit puree, lemon juice and pineapple) and the fresh, well-balanced American Honey Moon (Jack Daniels whiskey with honey, earl grey syrup, passion fruit puree, peach juice, lemon juice and Creole Bitter). There’s also a huge range of whisky, rum, gin, tequila and vodka brands to choose from (€12-€16). The only way in to Blaine is by providing a password, which changes every week – you’ll need to go on their Facebook page and send a request via private message.